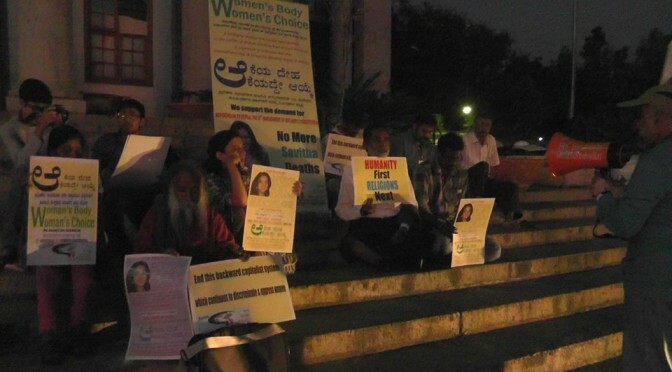 Yesterday Evening on the Steps of Town Hall, Bangalore we had a very spirited protest event which part of the International Day of Action for the Right to Safe & Free Abortion. Around 20 people attended the event which culminated in a Candle light Homage to those uncounted women victims and their families around the world, because of antiquated, fundamentalist and medieval laws that oppress women. Yesterday marked the second death anniversary of ‪#‎SavithaHalappanavar‬ an immigrant from Karnataka, India, who died because she was denied the right to abort her 17 weeks pregnancy in Ireland’s Galway Hospital, Dublin. 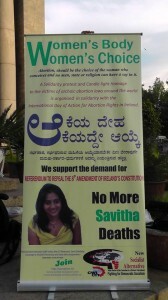 The Catholic Church of that country which is criminally enmeshed with the state and its policies killed Savitha, by giving the reason that being a Catholic country, foetus is more sacrosanct than a woman’s health and life. The protest organisers and the participants unequivocally condemned the ruling classes that oppress Women in the name of religion even to this day of 21st Century. The Protest demanded the Repeal of 8th Amendment of Ireland’s Constitution which is archaic, and goes against the fundamental right of Women in that country and the choices they have. We sold 5 copies of our paper, and made contacts with two male students hailing from a Jesuit run College! They had come to know of the protest through the facebook page.